Kombucha Benefits: Are They True or Hype? Is It a Probiotic Drink? Kombucha Benefits: Truth or Hype? Kombucha benefits are said to be incredible. Some people consider it to be a cure for everything. What is the truth? Is it a probiotic drink at all? I've reviewed over 27 scientific studies to find out what has and has not been proven in the scientific community. Then, check the comments below to see what kombucha benefits readers have had! If you aren't familiar with this drink referred to as KT, read this page about what it is and what is in it. It is already well known that black, oolong, green and white tea (Camellia sinensis) leaves possess plant compounds and amino acids that give them antioxidant, antimicrobial, and anti-anxiety properties. However, kombucha is found to possess enhanced antioxidant activity compared to unfermented tea. That is a fact. This is due to the interactions between the microbes and the sweet tea. Diabetes: Normalized blood glucose, plasma insulin, hemoglobin A1C, glutathione content and altered antioxidant enzyme activities in the pancreas, liver, kidney, and heart tissues of diabetic rats. Inhibited starch breakdown by pig pancreatic enzymes in vitro which may have an impact on starch digestion and on net absorbed glucose. Liver function: Liver protection and detoxification from acetaminophen overload in mice. Gastric ulcers: Antioxidant activity and protection of mucous in gastric tissues in mice. It was as effective as omeprazole (3 mg/kg) in mice in healing the ulcers. Cancer: In vitro lab tests showed that fractions of kombucha are believed to affect a number of processes that include cell death and inhibition of tumor growth and invasion of human lung carcinoma cells, human osteosarcoma cells and human renal carcinoma cells. Immune response: In rats, kombucha relieved immune suppression caused by lead and chromate. Gamma radiation: In vitro, there was a protective effect of kombucha chromosomal aberrations induced by gamma radiation in human peripheral lymphocytes. Anti-microbial actions: Many pathogens were sensitive to kombucha when tested in vitro. Does This Mean That Kombucha Benefits are the Cure for Everything? Absolutely not! There is not a single type of kombucha world-wide, so every SCOBY will have its own characteristics. Therefore, no specific health claims can be made about common KT. To me, the research showing its protective effects to the stomach, kidneys, liver, pancreas and heart in lab animals is proof that some health benefit is provided. Can that be quantified in humans at this point? No. Does that mean it won’t be quantified in the future? Hardly, since research on kombucha benefits is continuing. 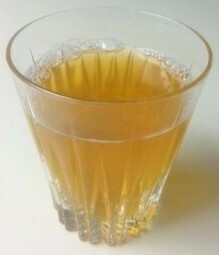 Many people have stories about the kombucha benefits they have experienced. Do YOU have a story to share? Please comment below or contact us. Is Kombucha a Probiotic Drink? Based on the kombucha benefits from studies previously mentioned, many researchers consider kombucha to be a probiotic drink. Some researchers even believe that kombucha tea or its pellicle may be a “promising formulation of a probiotic/prebiotic for extreme expeditions on several reasons” (Kozyrovska, et al,. 2012) including expeditions such as in mines, in polar regions, on submarines and even in space! If you are new to kombucha, a good bottled brand to try is GT’s Enlightened Organic Raw Kombucha. Just be sure to read the labels because they sell some varieties that are high in sugars. Other brands I have tried have tasted more like sweet soda! What I consider to be a better and less-costly alternative is to brew it at home. There are many products in the marketplace but my personal preference is KombuchaKamp.com. I bought a continuous brewing system (CBS) years ago before I knew about Kombucha Kamp (and their cute brewer caps!) and am now enjoying kombucha anytime I please. Additionally, I have been able to bottle some and give it to family members who live elsewhere. This an actual picture of my brewer under the kitchen cabinet. The pieces of masking tape with writing on them are notes to myself; relax, yours will not come with it! If you buy your brewing system from Kombucha Kamp, you can choose from several styles and colors of brewing vessels and from several colors of brewer caps. 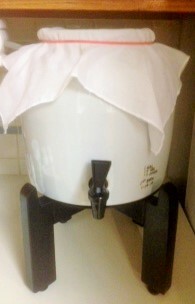 I am going to order a brewer cap instead of using the plain white cloth with a rubber band once our kitchen is remodeled. Although the rubber band works well, it is not the most decorative thing, especially in a remodeled kitchen! I’ve been drinking bottled kombucha for years and buying some for my children, spending close to $3 per bottle for 16 ounces (2 cups). The CBS is saving me money, letting me control the ingredients, and providing me with convenience and a continuous brew. I’ve added kombucha brewing to my other culturing practices such as milk kefir, water kefir, yogurt and cultured vegetables and will be providing best-practice tips and the results of my flavoring experiments (with technical data such as pH and sugar content) with my newsletter readers. Return to page about what kombucha is and what is in it.